I had a birthday on November 5. This was the date my blog flatlined. It may be related to a little mid-life shindig where calm and mature self-reflection morphed into yelling at God and my friends and the ladies of The View. WHAT IS THAT BLASTED TICKING SOUND? WHY IS MY HAIR NO LONGER SHINY? Seriously, what's a girl got to do to maintain some Kelly Kapowski hair? I'll share a little more about the Rabbits being dead in the water tomorrow. I promise. 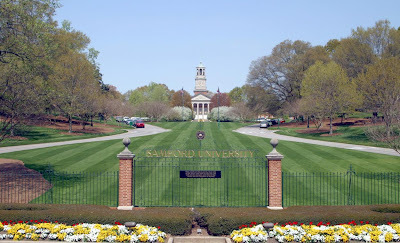 This morning, I went to Samford University, for work. For reference sake, SU is a religiously-affiliated institution. As I drove around the gorgeous campus, I was transported to a time several years ago when I hit a boy in khakis & a polo because my laser vision had locked on an available parking spot and not the road. He was fine, so good times. Today, as I drove 15 mph, I noticed a boy chatting with a girl in an adjacent parking lot 100 feet away. He started running. Fast. In the next 4.5 seconds, I imagined hitting him with my car. Not in a vindictive way, but simply because it might be unavoidable. Plus, I had the right of way - no crosswalk, no stop sign. Then I thought of the wisdom of Evelyn Couch who, in a similar situation, responded "I'm older and I have more insurance." But then he stopped running. But he started running again. And he tripped and made out with the sidewalk. I slammed on my brakes and swerved right into a road sign. Him: Dude, you almost hit me with your car?" Me: DUDE, YOU RAN OUT IN FRONT OF ME!!! Him: I was late for Econ and I thought I could make it. Me: Dude, you CAN'T RUN in Toms. That's why the kids in AFRICA don't even want them!!! Me: Let's start over. My name is Jamie. Him: Hi. My name is Peter. Me: You're kidding, right? Of course, you're Peter. Me: You know, doofus disciple who did stupid things before thinking? Peter: Dude, Peter was awesome. Me: Well, this was your equivalent of trying to walk on water. God may be trying to rid the earth of guys wearing women's jeans and plaid shirts. Glad you are blogging again!! And if he had made up his mind about whether or not he could make it to Econ, he might not have tripped and fallen. Thank you for validating my personal opinion of Peter. No offense to my Catholic friends, but I think of That Guy Who Cut Off Another Guy's Ear And Made Jesus Basically Have To Say "My Bad" And Put It Back. Glad you're back. Glad he was okay. Can't wait to hear more about what's up. Welcome back to blogging. You've been missed. I'm glad you are back!!! TS: Me too I think! KO: Great description of Peter! L: That's my goal. Always. Even when I don't see you. KE: No one died. All is well. M: So many stories to tell! P: No, your the best Alli. AW: It's like you didn't even miss me. It probably helps that I'm down the hall and I can tell you these stories in person. Welcome back!! I missed you! I'm gonna have to agree with God on this one...the world needs less dudes wearing womens jeans, plaid shirts and toms. S: I'm glad to be back! Yours is one of the blogs I missed the most! I just came across your blog from Alabama Bloggers and this post made me laugh so hard!! I agree with you on the fact that boys in skinny jeans just need to go. Keep writing! :) Alli @ Sweet (New) Home, Alabama. AB: I'm headed straight to your blog home now! Thank you for the kind words!